The Turtles embark on an out-of-this-world adventure to save Earth in Teenage Mutant Ninja Turtles: Beyond the Known Universe. This two-disc, 12-episode adventure is available on DVD May 24th. In the first 12 episodes of season four of Nickelodeon's hit television show; Leo, Raph, Donnie, and Mikey embark on their most epic adventure yet--outer space! Allied with a cyborg known as the Fugitoid, the Turtles hurdle through space, meet strange and bizarre alien creatures, and combat galactic monsters in a race against time to save planet Earth. The DVD release coincides with the upcoming Paramount Pictures feature film Teenage Mutant Ninja Turtles: Out of the Shadows that opens in theaters June 3rd. The DVD comes with a National Movie Cash offer of up to $8.00 ($8.50 in Canada) off your ticket for the new film as well as a Michelangelo zipper pull as a gift with purchase. SWEET! My boys love TMNT and we own lots of DVDs. This was a great addition to our collection. Season 4 is packed with "totally tubular" episodes. My sons loved that the Turtles were integrated with space elements for a galactic adventure. 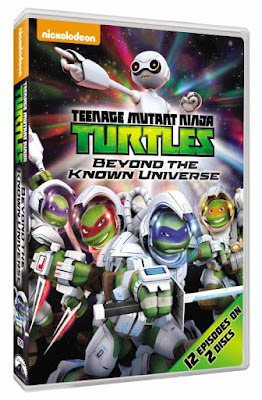 Grab this DVD for your Turtle fan, right now it is just $13.99 on Amazon! Plus a Special Feature: TMNT: Kicking Shell & Taking Names - Series recap.